If you are Catholic and a blogger, but you don't make any money off your Catholicism, you're automatically an Amateur Catholic®. 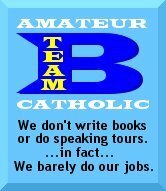 However, to be recognized by your peers as an Amateur Catholic®, you should be registered and sport the B-Team badge®. We have the Charter Members already, and there are a few Professional Amateurs in the works, but what we would like to do is create some value to the status of being an Amateur Catholic® and have a criteria for placement of applicants. To enroll as an Amateur Amateur all you have to do is drop us a line with your details. To be enrolled as a Professional Amature, drop us a line and tell us why you deserve that honor. Please be light-hearted and make it fun. All entries are subject to being posted here (so make it good, that way we all can enjoy it). Wonderful stuff Rick! My blogging is done for the 40 days of Lent but with Easter I'll be back in full force! I do indeed blog for fun and friendship. I'm glad to see you might be blogging again to. The only thing I ever make money from is sweeping floors at UPS, blogging has come at the expense of homework more often than not, and I would't have it anyother way. Additionaly I actually was on the B team for freshman football, and I didn't start on that either. I am as ameteur as it gets! Let me know when you're putting the "C" team together. This isn't just a ploy to increase your collective chances of pulling in one of those coveted Blog Awards, is it? Rick, this is so cool. What a great idea. I am not even a blogger although I have tried without success to become one. I have a problem with filling in the blanks on the start up form! Now isn't that pathetic? Anyway I'd like to be on the B team. I have been known to bloviate on the subject of Catholicism but mostly to my patient husband. I haven't annoyed the whole world or even attempted it. But as I am very articulate and have more time than money I could become better and better. Well, Sue, I don't think there's anything in the by-laws that says you have to be a blogger even the the definition of a B-Team Catholic blogger sort of demands it. Anyway, if you're with us in spirit, I guess you could consider yourself in. Though I can't say I'd be able to hang up my blogging gloves either. Maybe for a week or a month, but not permanently. I hope to see my blog "Orthodoxy - right teachings for a right moral compass" on the B-list. Right now, I consider myself a D-lister, only getting hits from a few friends (not even family), as well as some of the Yahoo! msg board people I argue with. I'm so B that I can't even find a rhythm in blogging, and that *proves* my amateur status. Hey, if The Curmudgeon, Recta Ratio and Funkydung are good enough for you, I should be able to qualify as well. Put me on the list and I'll be proud to sport the B-Team logo!! Count me in! I have visited so many of these blogs, wondering what the 'B team' was, and now, I'm honored to be asking for you to include me on the B list. I just started blogging a couple of months ago, and love the company of my Catholic blogger friends. I would love to be on the B Team! Credentials you say . . .? Well, my brother-in-law writes Seeking Justice and has mini-blog battles with Mark Shea concerning the death penalty and torture. That makes me twice removed from an A Team blogger which in my opinion fully qualifies me for B Team status! After months of considering it - oops, it's Lent and I gave up lying and cracking my knuckles - after stumbling across you once again after thinking I should join several times before but never getting off my pew occupier and actually doing something about it, I request membership in the B Team. I must be slow - what is the difference between pro amateur and amateur amateur? I am so intrigued by this Amateur Catholic idea. I initially considered my self an Amateur Catholic. But actually, as a teacher in a Catholic school, I suppose I am a professional Catholic. But I am totally in the minor leagues. Got a logo for that? Considering starting a blog with a Catholic focus - I am sure I will be back.